One of the great privileges of reviewing art is that once in a starry night, you come upon an exhibition that is unusual and/or powerful enough to promise inspiring memories of it forevermore. That said, The Real Van Gogh: The Artist and His Letters is the only exhibition in my ever lengthening memory which not only easily slots into but also, surpasses any hopes or expectations on both counts. Perhaps that is because Van Gogh toiled so on his art, or possibly, it is because of his unwavering focus on his subjects, though without doubt, it is more due to the fact that whatever he created, Vincent Van Gogh created it with all of his heart and soul. Van Gogh’s astonishing legacy of artworks, created over the course of a mere decade (trust me, those of you who think a decade is a long time will come to believe otherwise) is not only ample enough to be spread across this expansive globe of ours, but it is revered and loved beyond the measure of any other artist of his era or of any other, in great contrast to the loneliness and scorn both the artist and his work suffered in his own time. 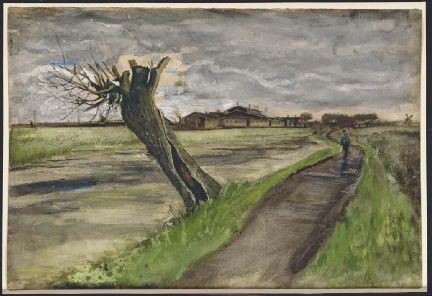 For contemporary viewers, this suffering only serves to add to the artist’s mystique and legend, as Van Gogh’s work, largely thought crude is his day now speaks to us of his abiding love of nature, life and mankind as well as of his deep spirituality, which is communicated to us so vividly though his drawings, canvases and letters. Imagine the delight then of Van Gogh enthusiasts who visit this exhibition only to find his heart-felt words accompanying his works, with thirty-five of his actual letters on view, alongside of relevant art, in a very real sense, speaking to us as the artist himself might have done, over a much longer period of time, had ill health and mounting despair not encouraged him to end his life prematurely in 1890, at the age of 37 before his artistic genius and soulfulness had been recognised. What makes so many of us want to know the life and art of this man, Vincent Van Gogh today, a man who was often lonely and isolated from society in his own time, an impoverished, largely self-taught artist who shunned worldliness in pursuit of something more eternal? It is without doubt, the shining beauty of his soul radiating back at us from his canvases that draws us to him and to his deceptively simplistic works. No artist in recorded history so elevated the everyday: trees, plants, flowers, birds, sun, rain, clouds – the very breath of earth and of life itself, and the very things we tend to rush by each day. 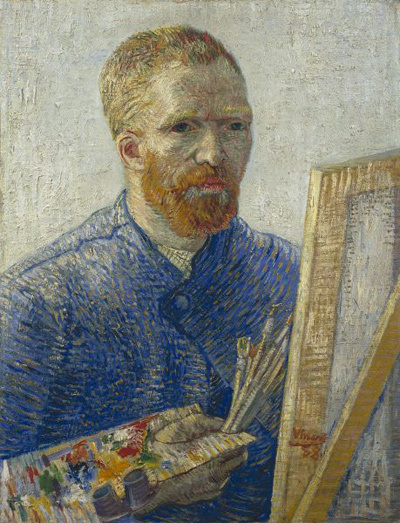 Perhaps then, Vincent Van Gogh is the ultimate outsider artist, and in hindsight, a champion of the outsider. His art is also a tribute to the heart to hand work of those artists who still believe in their creative expressions as something generated from their own unique creative vision. For those who are open to it, this will be much more than an exhibition. It will be an experience which teaches us about the paradoxical man and artist, who was Vincent Van Gogh. A man who, at his core, possibly more than anything else, wanted to be of service to mankind in some way, a man intolerant of frivolity and materialism, who was often ostracised for his failure to conform, yet pursued his artistic goals with all the fervour and drive of an Olympic athlete. A gifted artist who, sadly, began to suffer from strange and sudden seizures at the height of his creative powers and worked against the tide of time in order to produce as much work as humanly possible before his passing, and one who ultimately, ended his life according to his vision of it as being ‘for the good of all’. Though Van Gogh’s artworks were unknown at the time of his death, his work was already revered by many artists, among them Lautrec, Cezanne and Pissarro, whom he’d met in Paris. The exhibition is divided into seven comprehensive segments taking viewers through the brief but amazingly prolific life of Vincent Van Gogh, with each thorough and engrossing enough to be an exhibition in its own rite. 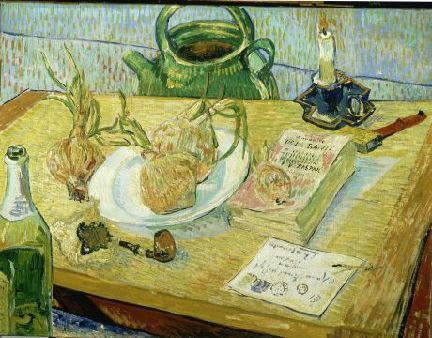 Nothing is overlooked, as each room offers drawings, paintings and letters as well as relevant images created by artists who influenced Van Gogh, among them woodcut prints by Hiroshige, magazine illustrations from English publications of the day and, of course, representations of work by Millet and, Rembrandt whose portraiture he especially admired. There are also editions of novels relevant to the time he read them in, photographs of Van Gogh’s family and fellow artists, and the places he lived and worked in as well as a timeline detailing his life and artistic output. 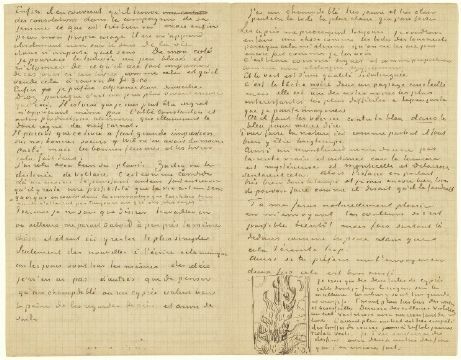 It is an inexplicably moving experience seeing the actual letters of Van Gogh, most of them written to his brother Theo, complete with miniature sketches relevant to the artworks on display, which he was then working on. 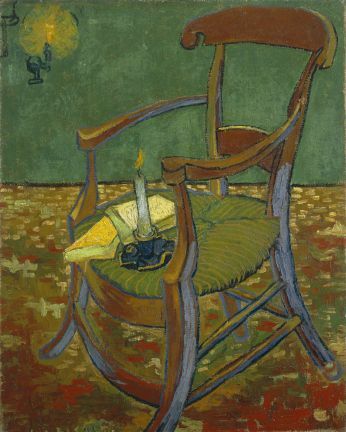 In addition, some of the paintings the artist instructed Theo should be ‘displayed together’ are exhibited here as Van Gogh would have wished at long last. 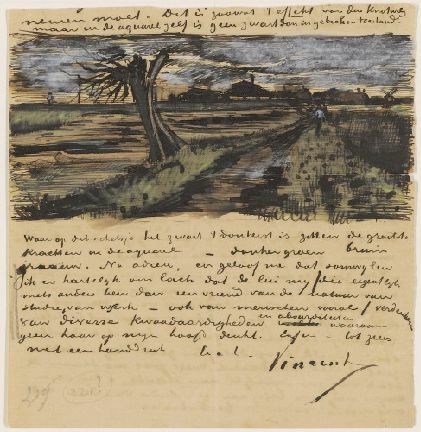 The manner in which the artworks, gathered from around the world, and the artist’s expressive but now fragile letters are displayed together also offers a rare opportunity to access Van Gogh’s explorations of various themes, his process and his artistic progress, enabling maximum appreciation of the artist himself as well as his work. As Van Gogh’s artistic outpourings are among the most valued in the history of Western art, suffice it to say that there are far too many treasures here to be able to mention in the context of a mere review. However, in addition to finding it informative beyond measure having his art placed in such an accessible and thorough context, I can say that for me, there were countless highlights, notably among them, many works I’d never had the privilege of seeing the originals of before such as the rather elegant Gauguin’s Chair, displayed here alongside of Van Gogh’s famous rendering of his own more rustic one. This exhibition also offers a chance to savour a fine selection of Van Gogh's beautiful ‘orchard’ paintings in which you can almost smell the blossoms and feel the gentle spring breeze on your face. The warmly glorious Wheat Field with Reaper at Sunrise (1889), displayed next to Enclosed Wheat Field with Peasant (1889) are together, representative of one such pairing as Van Gogh desired. 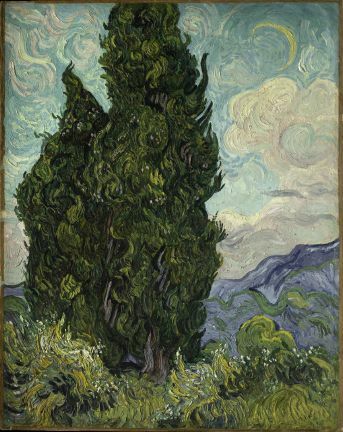 Though one could never tire of seeing wonderfully evocative paintings such as Cypresses (1888), Almond Branches in Blossom (1890) which Van Gogh created for his nephew and namesake, Entrance to Public Gardens in Arles (1888), The Sower (1888) with his blazing ‘lemon disc of the sun’ or Sower with Setting Sun (1888) the latter two of which are shown in close proximity to one another. 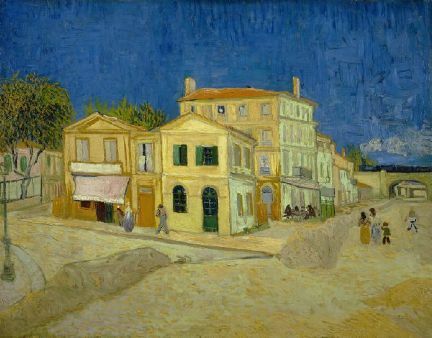 Multiple viewings of paintings such as The Yellow House (1888) the home in Arles where he created some of his most famous works and Self-portrait as an Artist (1888), both borrowed from the Van Gogh Museum in Amsterdam, offer additional insight into the life of this humble master. As anyone sharing my interest in this work and its creator would understand, it is difficult to limit the number of works chosen for inclusion here. However I’d like to add in closing that it was more than worthwhile being able to access so many of Van Gogh’s progressively more expressive drawings alongside of his paintings of similar subjects in conjunction with his marvellously intelligent and forthcoming letters, which though the chosen examples were written in French or Dutch, are also available to read in their English translations in the Reading Room of the exhibition at its conclusion. As there are only four computers available for this purpose, early arrival is advised! As fate would have it, the faith that Theo (who passed away six months after Vincent in 1891) had always had in his brother was eventually rewarded, for though neither brother lived to see it, the over 800 paintings and 1,200 drawings Vincent created would eventually come to not only support Theo’s young widow and son, but to feed the imaginations and souls of all those viewing them through the years, in a sense, interacting with enthusiasts of his art, just as his favourite authors, among them, Emile Zola, Victor Hugo, and Charles Dickens have done with their writing. All I can say to all those involved in the creation of this generously staged, enlightening, wonderfully tributary exhibition is thank you for sharing the very heart and soul of the artist and man that was Vincent Van Gogh with us. I will never forget the experience of being there, as close to Vincent himself as one could ever be now, one hundred and twenty long years after his untimely demise. Price includes £2.50 gallery guide.